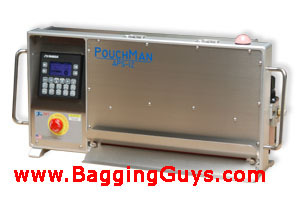 The PouchMan APS-12 Tabletop Medical Heat Sealer is a semi-automatic medical pouch sealer designed securely close the open end of Tyvek and Foil medical pouches. Simplified pouch sealing is realized with a unique Sense and Seal Technology. Handles Pouches up to 12.0"
* Dependent on pouch material and operator ability. Calculation assumes a 1-second load time. Some applications may require longer cycle times. To see other validatable pouch and bag sealing options, CLICK HERE!